Background: Leishmania is a parasitic protozoan of trypanosomatidae family which causes a wide spectrum of diseases ranging from self-healing cutaneous lesions to deadly visceral forms. In endemic areas, field trials of different preparations of Leishmania total antigen were tested as leishmaniasis vaccine. Two preparations of killed Leishmania major were produced In Iran, which were heat-killed vaccine called autoclaved L. major (ALM) and thimerosal-treated freeze-thawed vaccine called killed L. major (KLM). In this study, the protein content of both ALM and KLM were compared with that of freshly harvested intact L. major promastigotes using sodium dodecyl sulfate-polyacrylamide gel electrophoresis (SDS-PAGE). Materials and Methods: L. major (MRHO/IR/75/ER) from pre-infected Balb/c mice was isolated with modified Novy-MacNeal-Nicolle (NNN) medium and then subcultured in liquid RPMI 1640 medium supplemented with fetal calf serum (FCS) 20% for mass production. Two preparations of KLM and ALM were produced by Razi Vaccine and Serum Research Institute, Iran, under WHO/TDR supervision. Electrophoresis was performed by SDS-PAGE method and the gel was stained by Coomassie brilliant blue dye. 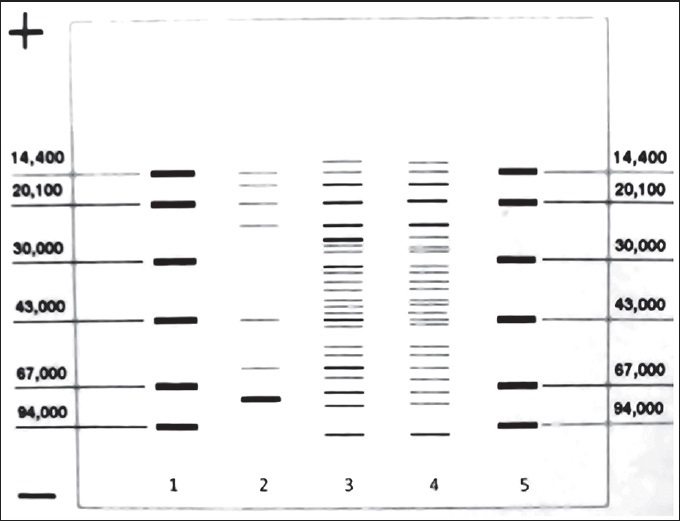 The resultant unit bands were compared using standard molecular proteins. Results: Electrophoresis of the two preparations produced many bands from 10 kDa to 100 kDa. KLM bands were much like those of freshly harvested intact L. major. Conclusion: It is concluded that although there are similar bands in the three forms of Leishmania antigens, there are some variations which might be considered for identification and purification of protective immunogens in a total crude antigen, and detection of their stability is essential for the production and marketing of a putative vaccine. Leishmaniasis is a tropical disease caused by different species of Leishmania. The disease is endemic in different regions of the world including some parts of Africa, Peninsular India, the Middle East, southern Europe, and South and Central America, and can cause a wide spectrum of diseases ranging from a self-healing cutaneous lesion to a fatal visceral form. Cutaneous leishmaniasis (CL) is the most common form, and it is estimated that each year, 1.5 million new infections occur by various species of Leishmania in endemic areas of the world. , This form of disease can produce disfiguring lesions which, in many cases, cause psychological effects such as seclusion. Leishmania parasites are transmitted to the mammalian hosts by the bite of infected sandflies. The fact that different species of Leishmania have distinct vectors, reservoirs, and hosts makes it difficult to control leishmaniasis and define a unique prophylaxis measure. On the other hand, chemotherapy is costly, needs long-term injections, and is not always effective. During the past two decades, drug resistance has been reported. Historically, it is shown that recovery from CL is accompanied by long-term protection and generation of immune responses against leishmaniasis. ,, Therefore, it seems that development of an effective vaccine against the disease is possible, but global efforts to search for a vaccine have so far been without results. Cellular immunity can play an important role in the protection and wound healing of CL, which may be achieved by vaccination. To create immunity in susceptible hosts, their immune systems should be stimulated somehow, so that responses of T cells lead to the development of species-specific immune responses. Based on this experiment, in this study, we tried to compare the differences in the protein profiles of autoclaved and killed Leishmania major (ALM and KLM, respectively) to those of freshly cultured L. major. In this study, the protein profiles of both ALM and KLM were compared with that of freshly harvested intact L. major promastigotes using sodium dodecyl sulfate-polyacrylamide gel electrophoresis (SDS-PAGE). L. major (MRHO/IR/75/ER), the same parasite and the same procedure which was used for ALM and KLM production was used in this experiment. The virulence of Leishmania was maintained with a continuous culture of promastigotes and inoculation of metacyclic into Balb/c mice. The parasite was derived from the popliteal lymph nodes of the mice. It was isolated first in Novy-MacNeal-Nicolle (NNN) medium and then subcultured in monophasic liquid medium, RPMI 1640, supplemented with 20% fetal calf serum (FCS) and incubated at 25°C. Promastigotes were harvested in the stationary phase and were washed three times. The pellet was resuspended in phosphate-buffered saline (PBS) and kept at −80°C until use. Molecular weight of each detected band in the gel was calculated using standard calibration curve formed from standard protein bands. The results of electrophoresis showed bands of molecular weight from less than 10 kDa to more than 100 kDa [Figure 1] and [Figure 2]. All bands of the three antigens containing freshly cultured promastigotes in related columns, with the exception of the two KLM bands (columns 2 and 5), were quite similar. These two bands in freshly cultured promastigotes were located in 24 and 57 kDa areas that were much stronger compared to similar bands of KLM. Other bands in columns 2 and 5 were similar to those in column 4. Compact and powerful dual bands in 71 kDa area were observed in ALM (columns 3 and 6), while they were not seen in KLM and freshly cultured promastigotes. Also, in ALM, there were weak bands in areas from 71 to 43 kDa and from 43 to 14 kDa, which were not seen in KLM and freshly cultured Leishmania. In recent years, studies on development of vaccine against leishmaniasis led to the point that a few preparations reached human clinical trials, , but so far, no vaccine is available against any form of leishmaniasis. ,, Among the experimental vaccines that were used in the Old World were KLM and ALM. In two different mouse models of L. major infection, vaccination with ALM plus CpG oligodeoxynucleotides (ODN) was able to control infection and markedly reduce lesion development in susceptible BALB/c and resistant C57BL/6 (B6) mice. Okwor et al. found that mice recovered from virulent live L. major infection when inoculated repeatedly with killed parasites. In this study, SDS-PAGE method was used to detect and compare protein profile of the two preparations. The advantages of this method are ability to detect small antigens and appearance of their component bands. It is known that SDS-PAGE method has high efficiency in the antigen separation,  as each component obtained by chromatography of the crude antigen could be separated into its constituent subunits. The aim of this study was to compare three different preparations of L. major. SDS-PAGE method was found to be a unique and effective method by Hejazi et al. to compare the protein content of L. major and Leishmania gerbilli. So, in a related study, antigenic differences and similarities between the two species were determined. As noted in the results, the electrophoretic patterns of the three preparations were almost similar except in a few aspects. For example, in ALM, dual 71 kDa bands were highly remarkable. They might have been produced by the accumulation of proteins due to the heating process. The blank areas of the ALM electrophoresis column compared with those of KLM and fresh harvested promastigotes show that one of the important changes is fragmentation of the major peptide sequences. Immunological studies indicated that specific regions of antigens have immunogenic properties. These parts are mostly available on the external surfaces of the antigen, especially in regions that arches polypeptide does not have strong third structure. Previous studies have shown that humoral and cellular immune responses were induced against different Leishmania positions. Thus, it seems that the fragmentation of ALM protein sequences due to heat induced peptides with smaller molecular weight required for T cell responses. Another point is that the enzyme activities in KLM still existed although the preparation was kept frozen in liquid nitrogen. Such activities caused due to heat deactivation of enzymes are very limited in ALM. As a result, due to the identical electrophoresis pattern, simple storage, and easy transportation of this form of vaccine, it can replace various physical forms of Leishmania vaccines. Further in vivo studies can confirm this finding. This study was financially supported by the Isfahan University of Medical Sciences. Alvar J, Vélez I, Bern C, Herrero M, Desjeux P, Cano J, et al. Leishmaniasis Worldwide and Global estimates of its incidence. PLoS ONE 2012;7:e35671. Alvar J, Croft S, Kaye P, Khamesipour A, Sundar S, Reed S. Case study for vaccine against leishmaniasis. Vaccine 2013;31:B244-9. Firooz A, Khamesipour A, Ghoorchi M, Nassiri-Kashani M, Eskandari S, Khatami A, et al. Imiquimod in combination with meglumine antimoniate for cutaneous Leishmaniasis: A randomized assessor-blind controlled trial. Arch Dermatol 2006;142:1575-9. Hadighi R, Boucher P, Khamesipour A, Meamar A, Roy G, Ouellette M, et al. Glucantime-resistant Leishmania tropica isolated from Iranian patients with cutaneous Leishmaniasis are sensitive to alternative anti Leishmania drugs. Parasitol Res 2007;101:1319-22. Hadighi R, Mohebali M, Boucher P, Hajjaran H, Khamesipour A, Ouellette M. Unresponsiveness to Glucantime treatment in Iranian cutaneous Leishmaniasis due to drug resistant Leishmania tropica parasites. PLoS Med 2006;3:e162. Khamesipour A, Dowlati Y, Asilian A, Hashemi-Fesharki R, Javadi A, Noazin S, et al. Leishmanization: Use of an old method for evaluation of candidate vaccines against Leishmaniasis. Vaccine 2005;23:3642-8. Khamesipour A, Rafati S, Davoudi N, Mahboudi F, Modabber F. Leishmaniasis Vaccine Candidates for Development: Global Overview. Indian J Med Res 2006;123:423-38. Mahmoodi M, Khamesipour A, Dowlati Y, Rafati S, Momeni A, Emamjomehi M, et al. Immune response measured in human volunteers vaccinated with autoclaved Leishmania major vaccine mixed with low dose of BCG. Clin Exp Immunol 2003;134:303-8. Clarisa B, Palatnik-de-Sousa. Vaccines for leishmaniasis in the fore coming 25 years. Vaccine 2008;26:1709-24. Shama U, Singh S. Immunobiology of Leishmaniasis. Indian J Exp Bio 2009;47:412-23. Fesharki RH, Agha SA, Ahourai P, Djavadian E, Taghavi A, Golabi A, et al. Vaccine preparation and quality control of killed Leishmania major. Arch Inst Razi 1992;43:39-50. Chakavarti B, Chakavarti D. Electrophoretic separation of proteins. J Vis Exp 2008;16:758. Noazin S, Khamesipour A, Moulton LH, Tanner M, Nasseri K, Modabber F, et al. Efficacy of killed whole-parasite vaccines in the prevention of Leishmaniasis- A meta-analysis. Vaccine 2009;27:4747-53. Noazin S, Modabber F, Khamesipour A, Smith P, Moulton LH, Nasseri K, et al. First generation Leishmaniasis vaccines: A review of field efficacy trials. Vaccine 2008;26:6759-67. Bahar K, Dowlati Y, Shidani B, Alimohammadian M, Khamesipour A, Ehsasi S, et al. Comparative safety and immunogenicity trial of two killed Leishmania major vaccines with or without BCG in human volunteers. Clin Dermatol 1996;14:489-95. Rhee EG, Mendez S, Shah JA, Wu C-y, Kirman JR, Turon TN, et al. Vaccination with heat-killed Leishmania antigen or recombinant leishmanial protein and CpG oligodeoxynucleotides induces long-term memory CD4+ and CD8+ T cell responses and protection against Leishmania major infection. J Exp Med 2002;195:1565-73. Okwor I, Kuriakose S, Uzonna J. Repeated inoculation of killed Leishmania major induces durable immune response that protects mice against virulent challenge. Vaccine 2010;28:5451-7. Ogunkolade B, Monjour L, Vouldoukis I, Rhodes-Feuillette A, Frommel D. Inoculation of BALB/c mice against Leishmania major infection with Leishmania-derived antigens isolated by gel filtration. J Chromatogr 1998;440:459-65. Hejazi S, Soleymanifard S, Yousefi H, Ghavaminejad A. 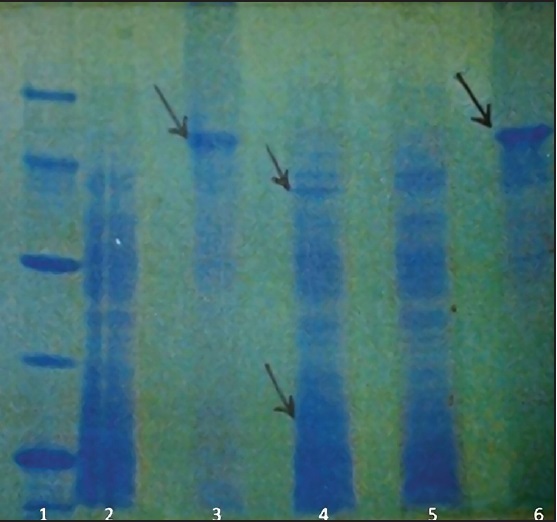 Investigation and comparison of L.major and L.gerbilli protein content by sodium dodecyl sulfate polyacrylamide gel electrophoresis. J Isfahan Med Sch 2000;17:14-7. Male D, Brostoff J, Roth D, Roitt I. Immunology. (seventh ed. )Mosby, Philadelphia 2006. 1 Low-dose Thimerosal (ethyl-mercury) is still used in infants` vaccines: Should we be concerned with this form of exposure?